How much does a suit cost to have made? There are a huge range of mills that I use that offer various price points. I am always happy to discuss budgets and normally we can find something to fit in. I have some cloth I bought on my travels, can I bring it to you to have made into something? A lot of my clients have brought in cloth to me. I am happy to offer a CMT (cut, make and trim) service. I’m based in Nantwich. My showroom is at Stapeley House. It’s on the road for Bridgemere and Dagfields. You’ll see the brown tourist signs. It’s next door to the RSPCA. You will see a sign for Stapeley house cafe. Turn in here. Go past the side entrance for the cafe to the big green main door of the building. There are parking spaces for visitors to the main building. If you come in there and ring the intercom or call my mobile (07815920222) I’ll come down for you. I am also in London and Glasgow each month with my pop up showroom. 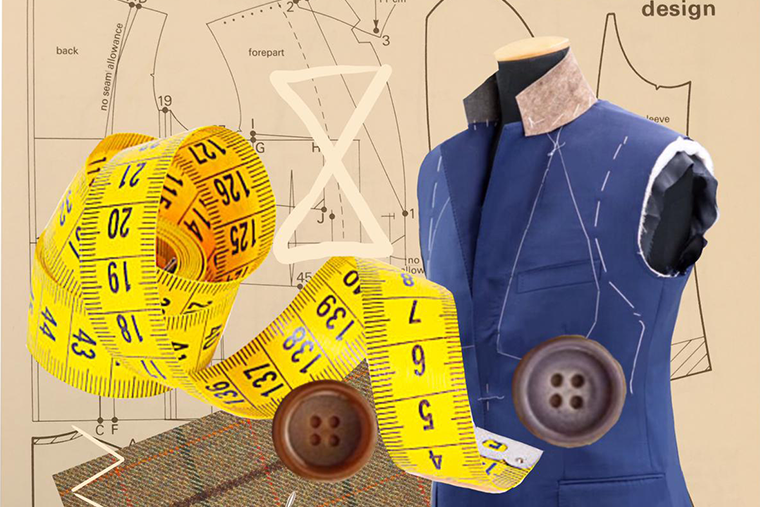 We offer a visiting tailor service. How long does a made to measure garment take to be delivered? I normally quote 4-6 weeks depending on the garment. If it’s a repeat client and we have all the pattern work done it can be quicker. We can offer an express 2 week service for a surcharge. You will come for an initial consultation- During this you will be measured and try on a few examples of tailoring that will give me an idea of your shape and stance. From this I have a very good idea of what we need to do for your pattern. As you have tried on existing shapes and styles that I have made the pattern for we can then get on with the pattern cutting and making based on that. You will then come for your fitting- You will try on your garment and all being well you can take it away that day. If any tweaks or adjustments are required we will get that done and turned around for you in 7 days. For a shirt allow 1 hour. For a jacket allow 1.5 hours. For a 3 piece suit allow 2 hours. It really varies. These are approximate guidelines. For first consultations where we are doing all the measuring the above is a good initial guide. It depends how much measuring we are doing; ie how many garments you are having. It also depends if you know exactly what you want or not. A lot of the time can be spent looking through cloth bunches and getting an idea of what you want. Discussing all the trim and styling information. It sounds a lot, but its great fun I promise. We have LOADS of cloth books and fabric swatches. I am happy to take you through different options. Sometimes just knowing what you don’t want will quickly help me get you to what you do want. Can I just call in to have a look? All visits to the showroom are by appointment only please. There is no commitment at all though. I’d be very happy to welcome you to the showroom even if you’ve not decided exactly what you want. I can show you examples of my work and talk you through the process. To book an appointment please contact us: 07815920222 or joanna@papastailoring.com.